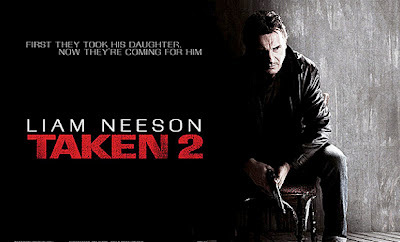 In the first Taken movie (2008), Bryan Mills (Liam Neeson) wreaked havoc across Paris to find his daughter Kim (Maggie Grace), who had been kidnapped and sold into prostitution by an Albanian human trafficking syndicate. Using his training as a CIA operative, Bryan kills and tortures anyone that gets in his way, but ultimately tracks Kim down and saves the day. Like so many other heroic tales in the movies, we pay little attention to the body count as long as the goal of the film is accomplished: find the girl, defeat the villains, save the world, and so forth. However, Taken 2 is the story of "what happens next." It reveals that, while Kim was saved from a life of prostitution, there are consequences to the extreme measures taken to rescue her. In the first film, Bryan killed many people including the gang of Albanians that kidnapped Kim at the Paris airport. Now the Albanian father (Rade Serbedzija) of one of those men wants revenge. For Bryan Mills, his singular focus on saving his daughter, no matter how noble, made him destroy the lives of others. Now we see that those actions have serious consequences, as the Albanians out for revenge will stop at nothing in their resolve to punish our hero. They seek to, once again, kidnap Kim along with her mother Lenore (Framke Janssen) and Bryan himself - and destroy them. Looking inward at our own lives, do we get so caught up in a singular focus or task that, like Bryan Mills in the first movie, neglect to reflect on the consequences of our actions as we move toward that goal? For instance, are there times when we get so focused on getting a job done at work that we ignore our colleagues or family members in the process? Or is there a cause that is so noble and for which we are so incredibly passionate about, but because of our passions, we end up ignoring other matters or end up hurting others in our fight for that cause? While (hopefully) none of us are like Bryan Mills nor choose to kill without hesitation for our singular focus, we can easily fall into his line of thinking. We can find ourselves so wrapped up in one thing that we loose sight of so much else. Our actions have consequences, even (and especially) the ones we don't even realize we're doing. Perhaps the first movie's Bryan Mills is so entrenched in his CIA training that he never realized that he was destroying others' lives in a passionate struggle to save his. In this movie, it seems, he begins to notice those consequences. Even in domestic matters, he has to live with the consequences of his actions in his broken marriage to Lenore or his overprotective relationship with Kim. We, too, must start to wake up to the actions of our lives. We have to be more conscious of what we are sowing in our race to the finish line. In the business world, in an attempt to cut corners and save costs, millions of lives are negatively affected. For instance, certain retail giants, in their corporate objective to offer customers low costs, choose to save those costs by using labor paid below poverty standards and treated with no dignity. The same is true with international trade companies (especially those dealing with coffee, tea, and cocoa exports) and Wall Street tycoons. What if, for a moment, those in the leadership of those companies decided to examine the consequences of their actions? In another example, there are those who feel so charged up about a certain political or religious issue that they will stop at nothing to make their point. This doesn't just apply to oppressive governmental regimes and religiously-inspired terrorism, but also to everyday individuals who are so very passionate about their beliefs. Even in small ways, such zealousness can harm so many others in the process. What if, for a moment, those who have such strong convictions stopped for a moment to ask themselves what consequences their words and deeds have had - and who or what has been harmed as a result? Sure, it is fun to watch Liam Neeson crush his way through Istanbul in this movie, just as it was thrilling to watch him in the previous film. So let us keep our desire for unbridled dedication to the movie theatres and the fictional story we see on screen - and not repeat his actions in our own lives. Let's let Bryan Mills have his day, but let's be aware of the consequences of our actions in every day we have from here on out. Let's be conscious of the people who may be hurt by our words or deeds, no matter how noble or profitable they seem to us at the time. And should we find that we have hurt others in the process, let us pray for our forgiveness and that we might reconcile with those individuals or fix the damage we may have caused. In whatever quest we are on today or those we will engage in tomorrow, let us always sow good works: love, awareness, compassion, and patience - for those are actions with consequences we will most certainly want to receive from the Lord and from others.